Every month or so, I try to find out about forthcoming shows in Dublin, so I scan the websites of the big receiving houses. When I do so, I always find myself typing out a URL that is effectively obsolete – www.grandcanaltheatre.ie/ That always redirects me on to another page, which gives me that theatre’s new name. Perhaps it’s petty, but I just can’t bring myself to type in the words “Bord Gais Energy Theatre”. Like many people, I was disappointed by the theatre’s decision to dispense of a name that seemed elegant, atmospheric and apt – and to sell the naming rights to a utility company. Leaving aside other considerations, the name seems ugly to me, and I always find myself thinking of Gwendolen in Importance of Being Earnest: “there is very little music in the name, if any at all, indeed. It does not thrill. It produces absolutely no vibrations”. Well, “Bord Gais Energy Theatre” produces no vibrations, at least in me. Who wants to go to a theatre with homonyms of the words “bored” and “gash” in the title? Likewise I find the inclusion of the word “energy” in the title troubling, as if I am expected to arrive at the theatre really keyed up for a show. And shortening it to “b-get” doesn’t work: it always reminds me of those long lines of names in the Old Testament of men who begat other men. In fairness though, I am one of those people who still talks about going to the Point Depot or Landsdowne Road, so I would probably have been hostile to whatever name the theatre ended up having to call itself. Of course I know that theatres have to attract funding in order to stay open, and that the selling of naming rights is widespread internationally. But what bothers me about this kind of thing is that it turns us all into involuntary advertisers. I knew, for example, that eircom and Ulster Bank were title sponsors of the Dublin Theatre Festival – but I was never obliged to refer to those companies when booking tickets or arranging to meet friends for the shows. I saw the logos on posters, noticed the link, and in general had a higher opinion of the companies for their sponsorship. So all good there. But the selling of naming rights inserts brand names into our landscapes. So when I tell someone I was at a football match, I have to mention Aviva – and when I go to a gig, I have no option but to mention O2. This takes my private utterances and turns them into free advertising for companies that I may (or may not) like. To be fair, I have nothing against any of those companies. 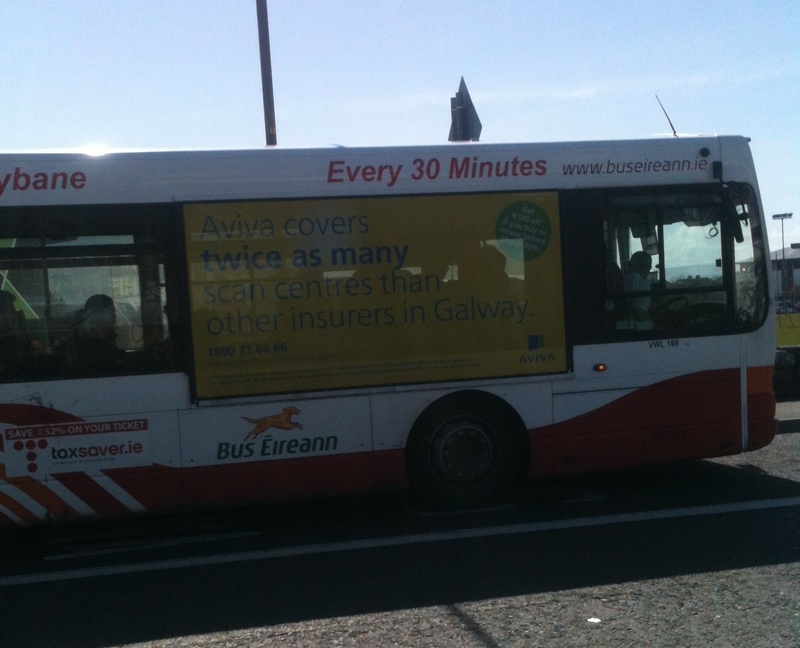 Well – with the possible exception of Aviva, who were responsible for the single most illiterate ad I’ve seen in a long time, which was posted to Galway’s buses during the summer. But like all good consumers, I value freedom of choice – why should we be forced to use a company’s name if we don’t wish to do so? Name branding also separates a building from its local environment, and thus from its history. When we see something at the Point Depot, we understand that building’s link with Dublin’s docks – we understand that it was once something else, that it has a past, and an interesting one too. But I often find nowadays that when people tell me they saw a show in “the O2” I’m not sure which one they mean – the Dublin or London one, or perhaps another someplace else? This flattening of local difference and distinction has significant consequences. People I know in the theatre will sometimes say that this kind of thing isn’t a big deal. There’s so little funding around at the moment, they point out: when we have a lovely building like the Grand Canal, isn’t the most important thing that it stays open? I have heard people say similar things about another recent marketing project, called the Arthur Guinness Projects. Anyone with an Irish email address will have heard of this recently. The idea was that arts organsations (and other groups) would compete for “votes”, and that the groups with the most votes would in turn go into a competition (adjudicated by relevant experts) for a modest amount of funding – which, in the case of Irish theatre, may result in the production of some plays which might otherwise not have happened so soon. Well, I look forward to seeing the work that is produced as a result of this but again, I found this project troubling. Like many people, I got dozens of emails and twitter messages, often daily, from practitioners looking for votes. Every one of those emails was an ad for Guinness. Every retweet was an ad for Guinness. Every time someone logged on to view a company’s profile, they were also viewing ads for Guinness. In the end, Guinness got a massive amount of advertising, and a proportionately tiny number of theatre practitioners will be able to make work. I’m not convinced that this was a good deal. Only 10% of the submitted entries make it through to a stage where they are judged by a panel of experts and I cannot tell from reading the website how many projects will actually be funded in the end. Ultimately roughly 290 arts projects will get no funding at all. That’s a lot of people who’ve spent their time letting us all know that Guinness cares about creativity and community etc. I worry slightly about such campaigns, which, while apparently well intentioned, may end up being inadvertently exploitative of the fact that some people really desperately need money in order to make art. It’s also important to say something that will be obvious but which bears emphasising: alcohol companies advertise not just to convince us to buy a particular brand if we’re out in the pub: they are also trying to shape our attitudes towards alcohol in general. It’s worth thinking about the positioning of this drinks multinational as a funder of work that will be young, edgy and experimental (the kind of work that won’t otherwise get funded). Much of this is surely an attempt to build brand loyalty. But some of it is shaping attitudes. So the next time we have a public debate about alcohol and its impact on our society and indeed on our people and their families, our response to that debate will be shaped to some small extent by these campaigns, and by other events such as Arthur’s Day. It was for similar reasons, after all, that tobacco companies used to sponsor art galleries. I don’t think any of the companies I’ve mentioned in this post is acting out of cynicism or opportunism or anything else – any more than anyone does when they advertise. Likewise I am certain that the people doing the assessing of all of these projects are doing so out of a firm desire to give up their time to help new work get off the ground. And overall I am quite sure that the decision to engage in sponsorship was made out of some enthusiasm for the arts (or sport, in the case of the Aviva). And again people I know who work in the arts have said that none of the concerns above really matter, that people are smart enough to make up their own minds, and that if work is being made – what’s the problem? But we must also acknowledge that those companies are trying to buy something that we as theatre-goers have: our awareness, our respect, our loyalty. That is quite literally a valuable commodity, and it belongs to us. And perhaps it’s easy for me to say this: I’m not trying to keep a theatre running, and I know very well how difficult and stressful it is for hundreds of individuals and companies in Ireland. But for my own part – I will continue going to the Bord Gais Energy Theatre. But I’m going to keep calling it the Grand Canal. This entry was posted in Irish theatre and tagged Grand Canal Theatre, sponsorship. Bookmark the permalink. Yes, “people in the arts will say [that] none of the concerns above really matter” however some of us in the performing arts have been raising the thorny question of corporate sponsorship for some time. I myself raised it at the 2009 Fringe symposium in my paper “ethics vs aesthetics: what’s the point” in which I attempted to articulate the gross contradiction and ethical bankruptcy of artists and arts organisations seeking to promote or explore a re-alignment of societal values under the banner of drink or banks. In my paper I expressed a belief, shared by many artists, that we need to “imagine a new form of theatre which regains its ethical authority to speak and instruct on matters of life and death. For this to happen a fundamental reappraisal needs to happen, of how our theatre is created, how it is funded…This would be a theatre free of corporate contamination, free of the patronage of the twin pillars of Irish destruction- banks and alcohol, for we lose all authority to criticize when we do so from within the same system which is responsible for social fragmentation and collapse”. (the full paper can be read here: http://ethicsvsaesthetics.wordpress.com/) These sentiments were met with some derision and accusations of being out of touch with the ‘foregone conclusion’ of corporate support, but as sport moves to usher in a ban on alcohol sponsorship, these ideas are beginning to gain traction. If we are not careful the arts will become the back door by which alcohol sponsorship maintains its place in the cultural bloodstream and I think artists need to be vigilant not to become pawns in that game. Arthur Guinness inc makes the laugh out loud claim that “We believe that now is the time to rewrite the rules and re-imagine an Ireland that we can all be proud of”. Until we reject the patronage of key forces who have helped create the mess we are in (drink, banks,oil companies and a host of others) Ireland can simply not be re-imagined. Thanks a million Dylan. It is definitely important to point out that there are many different views on this (and in fact I edited my original post shortly after posting it last night to reflect that). Thanks also for posting the link to your article, which I hadn’t known about and am definitely glad to be able to read. “If we desire theatre to achieve change it must transcend the confines of the theatre and achieve a currency beyond its context” – that is essentially the key question – and the key chalenge – for Irish theatre at the moment. I completely agree with you that things like the Arthur Guinness Project are a response to the moves to ban alcohol advertising at sporting events (though of course brands like Absolut have been a big sponsor of Irish arts generally in recent years anyway). It’s an important conversation to have – companies like Guinness are funding the arts because they think the arts have something to offer them in return. We need to have a debate about what that ‘something’ is, and about whether we as theatre-makers and/or theatre-goers want that ‘something’ to be commodified on our behalf.